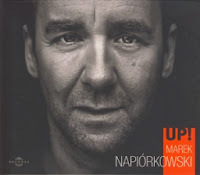 Although this is only his fourth album as a leader, Polish guitarist / composer Marek Napiorkowski is one of the most recorded artists on the local scene, being probably the most in-demand session guitarist since many years, which resulted in him taking part in over 140 different albums so far. He played and recorded with many world famous musicians and literally with everybody who is anybody on the local Polish scene; people like Tomasz Stanko and Anna Maria Jopek, to mention just two extremely different environments, which emphasize his legendary diversity and chameleonic ability to suit every musical milieu. This is by far his most ambitious project so far, which involves eight of his original compositions arranged for a Jazz ensemble and a nine-piece chamber ensemble. The Jazz players are saxophonist Adam Pieronczyk, bass clarinet player Henryk Miskiewicz, pianist Krzysztof Herdzin, bassist Robert Kubiszyn and American drummer Clarence Penn. Herdzin was also the man in charge of the arrangements, orchestration and conducting the chamber ensemble, turning him in many respects into the most significant contributor to this album alongside Napiorkowski. The result is a sophisticated Jazz-Classical Fusion, based on solid melodies and featuring many excellent guitar solos, which floats between energetic up-tempo moods and gentle melancholic themes. Although the individual tunes are not related per se, the overall ambience and atmosphere of the album turns it into a kind of orchestral suite for chamber orchestra and Jazz soloists. The guitar work on this album, both in the acoustic and the electric tonalities, is simply brilliant and for me the best ever achieved by Napiorkowski. Rather than trying to prove his ability as a player, which is already established anyway, Napiorkowski really concentrates on playing music, the essence that so often tends to be forgotten in favor of flashy emptiness. Herdzin, the Polish musical Wizard of Oz, once again manages to sprinkle his magic all over this music, both as a pianist and of course as the man behind the ornamentation, which makes this music spark and sizzle. Luckily he found the way of balancing the basic Jazz contents and the chamber enhancements, keeping them both intact and coexisting alongside each other rather than mixing them into an undistinguishable mesh, which happens, unfortunately, way to often in such situations. Herdzin is probably the only person on the local scene who can pull this off. Some listeners might have a problem to identify with this music, which often happens when an Artist changes his established path in search of new means of expression. Perhaps this will be either too Jazzy or not Jazzy enough for some? One can never satisfy everybody and it's preferable that the Art prevails rather than the attempt to be liked by everyone. This album is a statement by a mature, self-aware musician, who presents his vision, hoping that other can share it with him. I certainly hope many will do so!